Many crystal books have been written, and like most people I have my favorite ones. The books about crystals that are reviewed below were chosen based on my personal preferences, but this is only my opinion. There may be other books on crystals that I don't know about out there, and if so I would love to hear about them. The order of the reviews does not in any way indicate whether they are a better book than another. There may even be books that are not covered on this page that are better than the ones that are reviewed here. These are my choice of the top books that are currently available. This may be because of the way that the author describes the stones, or it may be the way that they outline how you may use them and the description of their metaphysical properties. Those listed on this page are chosen as they provide greater clarity in the descriptions of various stones. In addition the crystal books chosen below, all cover the healing attributes of the specific stones. If you wish to use crystal for healing, it is my opinion that the information presented in these books will be very helpful to you. For those who are new to crystals, there are a few books that I would specifically suggest you might like to choose, so I have outlined them at the top to make it easier for you. If you have a particular book that has helped you and that you would like to bring to my attention you may like to write a review of it yourself. Alternatively you may want to comment on any of the crystal books mentioned here. Have you just started your crystal collection? Have you been buying some of the more common stones and just want to find out more about them? If that is the case here are four books I would recommend for you if you are just starting out. The four books shown below are all written in an easy to read way. That makes it simple for those new to crystals to understand. While I have many reviews on individual books, I have highlighted these four as suggestions of good books to help you get started. Read on as I review these four books. 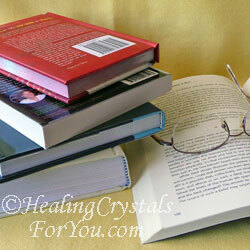 If you are not a beginner, you can skip further down the page, to where I review many other crystal books. Crystal Bible Volume One is written by Judy Hall. This is the first crystal book that I ever bought, and I still like it a lot. It is useful to carry with you as it is a good size. Compared to some crystal books it is not a big book, so it is easy to fit in your bag when you go crystal shopping. This is an advantage as you can look up stones when you see them, and its easy to carry. As for the contents, Judy writes well about the various crystals and Book One covers most of the more common stones, and some of the less common crystals as well. 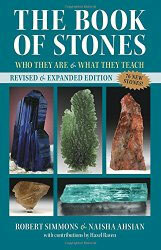 This book is well illustrated and most stones have at least two pages of good quality information, although this varies as some crystals that come in various colors may have quite a few pages. Judy Hall covers healing properties and metaphysical aspects, and in the back she has extra information such as healing layouts and a good glossary. It has a good index, although this is perhaps the only downfall in the book. The text in the index is very hard to read as it is so small. I find I have to use a magnifying glass to read it, so this is one small problem. Otherwise it is a good starters book as well as being an on-going reference book when you forget what a stone does! 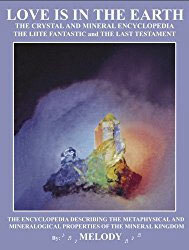 The Complete Crystal Bible is written by Cassandra Eason. The subtitle of the book reads, "500 crystals to heal your mind body and spirit", and this is an excellent summary of the books content. I like the size of the book, as it is small enough to be able to easily take with you crystal shopping yet covers a good number of different crystals. It is set out in a different way to other crystal books, as the stones and crystals are arranged by color. As many crystals of the same color will help similar chakras, this arrangement is an advantage if you wish to use them for healing, as this may help you to be led to choosing the right crystals. Another excellent point in its favor is that it has information on many of the less common stones, which are often difficult to get information on. Although it covers a lot of crystals be aware that there is really only a synopsis of each individual stone listed. Although it does not have a lot on each crystal, she has a small table for each stone listing other qualities. Overall it is one of the crystal books worth owning, from Cassandra Eason. 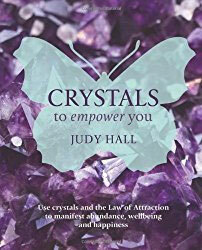 Crystal Healing is written by Judy Hall. 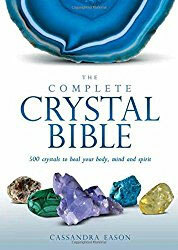 This book is the same size as the Crystal Bible, which is reviewed below, and gives you lots of information on stones to use for individual chakras. In the back of the book there is a chart called "Crystals For Specific Ailments". This lists health issues and the ailments that individual chakra stones will help, using the specific stones that are covered in the front of the book. Throughout the book are lots of body layouts for using Judy's chosen crystals for healing specific health issues and different ideas for using them. 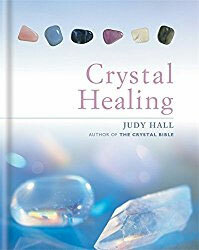 Judy Hall is very knowledgeable about the crystals she uses and she gives you extra information in this book that may not be in her other books. One of the more useful crystal books for those who need to learn how to lay stones on the body for healing. Definitely worth reading, and owning as reference if you wish to use your crystals for healing yourself or others, and a great book to get started with crystal healing. 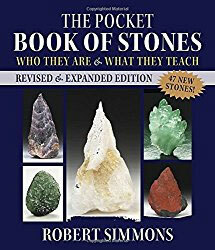 The Pocket Book of Stones is written by Robert Simmons and is similar in nature to his bigger book, but this volume is written by him alone. It covers information in a similar way to his larger book, but of course this is a cut down version. It gives you more condensed explanations of various stones that he covers in his larger volume. I bought it to check what it was like and it has short explanations, which may be helpful if you were out shopping. It may have been published to counter the popularity of Judy Hall's books, which fit easily into your bag to take shopping with you. It also covers a fair number of the stones that are specifically well known to be related to Robert Simmons, as they are his trademarked stones. Covered below are reviews of many more crystal books. There are so many books out there that like all of you I have to be discriminating in my choice of books both to buy and to review. I have bought a few books by authors that are prolific writers, but I have not reviewed them here, as I prefer not to be negative. So I only cover those books that I would personally would choose to buy either for my own collection or as a gift for others. Any books that I do not feel are worth using I give to a local charity shop! You may notice below that there are a large number of books covered in these reviews that are written by Judy Hall. Judy Hall is a prolific writer and most of her books are probably worth owning. Judy's Jasper is also called Eye Of The Storm. It was named after Judy Hall. I say probably as I do not own every single one of her books as there are too many! I have reviewed many of her books, but it is getting to the point that she has so many great books that it is hard to cover them all here. 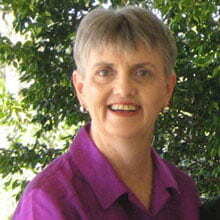 Check out the Judy Hall page at Amazon, where you will see the full range of books written by her. But you will find many more, so take a look if you like her work. Of special note are her three Crystal Bibles. These are definitely worth owning and as a set cover many of the stones that are commonly selling. To read reviews of books by other authors, please scroll down the page. 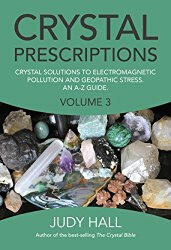 Crystal Prescriptions Volume Three is an extremely valuable resource for anyone who is finding life difficult due to a sensitivity to electromagnetic devices. This book is very helpful if you are having issues with mobile phones or wi-fi, as it covers many useful aspects of the situation including information on Geopathic Stress. If you are being affected by the endemic electromagnetic pollution in our world, and need help with how to deal with its effects on your body, this book is an excellent resource. There are now four different Crystal Prescriptions books, and I have to let you know that I do not yet own all four. I added her first Crystal Prescriptions books to my collection when it was first published, and found it was very useful with its list of stones to use for various reasons. I bought Crystal Prescriptions Volume Three when it was published in 2015, as its subject interested me. I had become seriously sensitive to electromagnetic devices, and I found it quite useful. If you are in this situation, you may find its information very helpful to you. 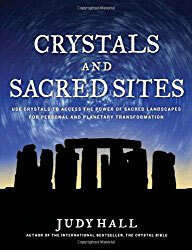 Crystals and Sacred Sites is written by Judy Hall, and the subtitle of this book is "Use Crystals to Access the Power of Sacred Landscapes for Personal and Planetary Transformation". 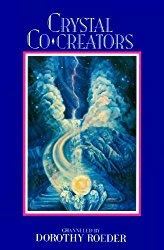 This book has a large amount of information about specific crystals that can be used to aid you to make a connection to the energy of the various sacred sites around the world. Judy Hall has researched this area in great depth, and I truly enjoyed reading about the many places she covered. There are many sacred sites listed, with locations spread all over the world, and the information is particularly useful and very interesting if you are interested in the connection between Spirit and the crystal world. There are many places she takes us to explore, including taking a journey from the pyramids of Egypt, to Mt Sinai, Uluru in Australia, the Narmada River in India, and using Shiva Lingam stones. You travel to Hawaii, Pipestone, Sedona and Mount Shasta in the USA, Canada, New Zealand, Afghanistan, Machu Picchu, Glastonbury and Stonehenge in England. You learn more about Preseli Bluestone, as well as so many wonderful and rarely discussed places, and the stones that are found there. Many of these places are not often seen in crystal books. Judy Hall covers lots of information about the stones associated with these places and how to use them. Truly a beautiful book worth owning. 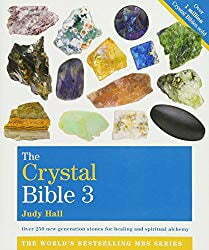 The Crystal Bible 3 is written by Judy Hall, and while Volume 3 has now been out for a while, like the two volumes before it, it is definitely a book to own. I would suggest that you add it to the list of crystal books that are worth having in your collection. I bought it as soon as I had found out about it, but was too busy until recently to really read it in depth, and since I have read it I must say its quite good. It is the same size as both Crystal Bible book one and book two, so it is easy to carry with you. But now there are three volumes you may have to decide which one to take! See Newest Crystal Bible Volume Three! I really like the list of crystals and stones it covers. Many are very uncommon, and this is great to see them there as many are not covered in the average crystal books. Prior to this Melody's big encyclopedia was the only answer for unusual stones, but now you can safely add in this volume knowing that it covers many less common stones. In common with volume one and two it has an index in the back, but again difficult to read as it is in very small print! It also covers some trademarked stones, such as the Azeztulite's and others that are in that group, that I won't buy due to my feelings about the way the prices have gone through the roof due to this practice. So if you want to buy these stones, this book gives you some information on their attributes. Crystals to Empower You: Use Crystals and the Law of Attraction to Manifest Abundance, Wellbeing and Happiness is written by Judy Hall and is published by the Octopus Publishing Group. It is also published under the name Life-Changing Crystals. I usually don't buy these type of crystal books, as the other volumes cover what I need to know. But in this case I was drawn to look at it because of its title, and it is very good to help you to utilize your crystals in a different way. It gives you a number of different ideas for using your crystals for manifesting abundance, happiness and well-being, all important to how you live your life. While it does not cover a lot of crystals, the ones it does cover are explored in some interesting ways, and I enjoyed reading it, and putting some of the ideas into practice. 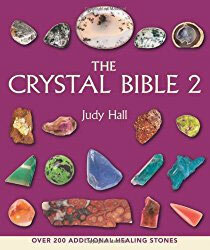 Crystal Bible Volume 2 is also written by Judy Hall, and like the first volume, Volume 2 of the Crystal Bible is also one of my favorite crystal books. When it came out it was a good addition to the first book as it covers some of the less well-known stones. As it is the same size as book one, it too is easy to fit in your bag. Although you may prefer to only carry one book at a time, in common with book one it has good references in the back and the index is similar to book one, also in small print! 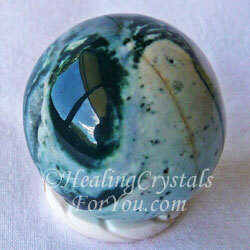 It covers a very good range of unusual crystals, many of which are now becoming more easily available than in the past. I really like this book and it is a book worth adding to your collection. 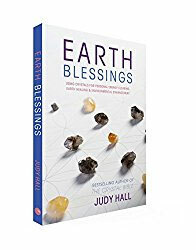 Earth Blessings is written by Judy Hall, and the subtitle of this book is "Using Crystals For Personal Energy Clearing, Earth Healing & Environmental Enhancement", and what an interesting book this is! This book was published fairly recently and I have been enjoying exploring what it has to offer in some depth. This is a book both for the person who has been using crystals for a while, and is also helpful for the beginner and for those who want to learn more about a range of less discussed crystal related subjects. Judy covers subjects such as clearing your personal space, information about the chakras, crystal feng shui, and in particular she tells us about ways to heal the earth using crystals. I like to use crystal grids, so I was especially interested in the information about using your particular crystals for grids, including a large number of excellent grid layouts. While I follow my intuition when building a crystal grid, this book has some interesting ideas. Judy Hall has been working with crystals for many years, and this comes through clearly in her writing. I really love her work, and would highly recommend this book, as it has lots of information about all sorts of things you don't find in many crystal books. In my opinion, it is definitely a book that is worth owning! 101 Power Crystals, The Ultimate Guide to Magical Crystals﻿ is written by Judy Hall and is one of Judy Halls more recent books and it is a beautiful book. It has some unusual characteristics, that make it very useful. In the front of the book is a long list, which I feel you might call "the power of" list. 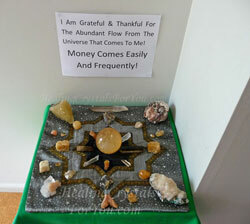 It gives a list, which has attributes, an example of one of these is: "The power of abundance: Citrine." It has excellent photography with one page per crystal. It has a photo on one side, with the attributes of the specific crystal opposite it. Under each photo is information telling you where to place it for healing, or how to utilize it. Because the book is bigger in size than her normal crystal books, she fits more on the page. It also has a smaller text size so it is possible she is able to cover more per page. It's a tall skinny book, so the downside is that you won't fit this one in your bag as easily as her Crystal Bibles. All in all another excellent book from Judy Hall. 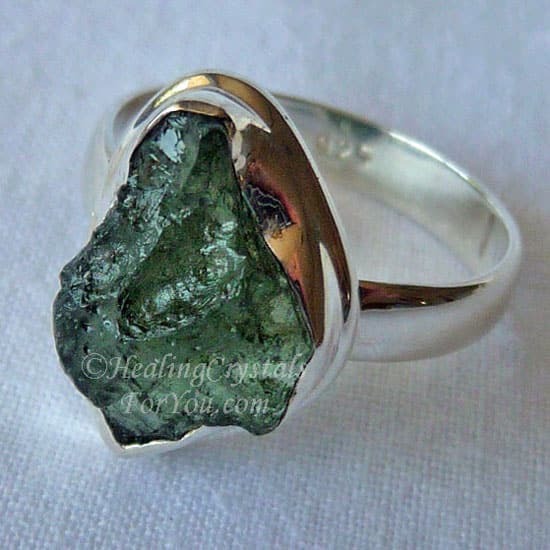 Moldavite is a high crystal energy stone. Then use your intuition to choose the one that you feel will most benefit you personally. The important thing is to get enjoyment out of using your crystals, and from reading about the attributes of various stones. Enjoy! Love is in the Earth Crystal and Mineral Encyclopedia is written by Melody. This is truly a wonderful in-depth book! The Encyclopedia of Crystals, Love Is In The Earth, written by Melody is an enormous book that covers a large number of crystals and certainly more than the average crystal books. This is the mother of all crystal books, with lots of good photos. 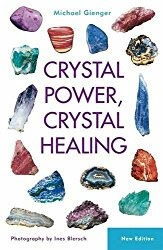 It provides in-depth analysis of the healing attributes and metaphysical properties of many crystals. If the only book you owned was this one, you would be well satisfied. It has 908 pages of reference material on crystals plus an excellent index in the back that makes it easy to find what you are looking for. Its number one drawback is its size as it is a very big book, too big to carry with you as it is very heavy, and sadly the price of the book has recently increased to a level that it is now less affordable for the average person. Its second drawback is that the way that the author writes about the stones is not always clear on first read. She takes a more scientific approach to her writing and the use of some words that are uncommon does make understanding a little difficult. This is the sort of book (encyclopedia) that you would keep at home and use as a reference. Be aware that there is also another book of a similar name by Melody, which was written in 1995, and you can also see it illustrated in the right column. This is not the same book as above, and some people buy it thinking it is the big encyclopedia above, but it is not, and does not have the illustrations that the big encyclopedia has. It has been around for years, as Melody wrote a series of books, and these are all normal sized, except maybe a little fatter. You have to buy the companion guide to get the photos of the crystals. The big encyclopedia as I call it, is certainly not a book to take with you when you go shopping for your favorite stones! But great to have to use when you get home to find out more about that crystal that you were unable to resist buying! 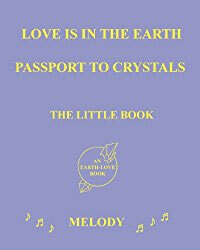 Love is in the Earth: Passport to Crystals - The Little Book, is the latest book by Melody, and this new smaller book was published in January 2013. This is possibly in response to the large number of smaller crystal books by other authors that have been published. While it is very small, smaller than any of the other books, and does fit in your bag easily, this is the only good thing about it. It has very limited information on each crystal, really only a series of words and a picture. I bought it because I was impressed by her large encyclopedia, but I would not recommend this tiny book, as I was very disappointed in it. I only note this so you are aware that this is a different book to the large volume that is so impressive. 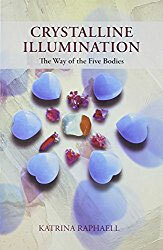 Crystalline Illumination: The Way of the Five Bodies is one of the latest crystal books published and is written by Katrina Raphaell. She is quite well known in crystal circles and her work was felt to be ground breaking back when she started writing about crystal properties. This is her latest book and relates primarily to working with some of the less well-known chakras and specifically to using particular colored crystals to aid these chakras. She is also the author of three other books, which you can see in the amazon search box below. They do have some interesting information on a number of crystals, but are not as in-depth as many other books. She has a different approach to her writing and also runs a school called the Crystal Academy, where she teaches about using crystals. Crystal Power is written by Michael Gienger. 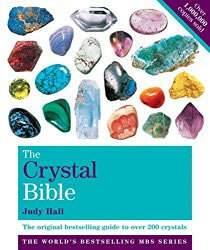 This book gives lots of information that is not in many other crystal books. It covers quite a lot of background on the origin of minerals and crystal structure. This information on minerals and what they are made up of, is more in-depth than I have previously ever seen in a crystal book. Ideas for using your crystals is also included. It covers the individual crystals in detail, one page per stone. Regarding the individual stones, it is not as in depth as some books, but covers the basics. It also has excellent photos of each stone. One of the crystal books that may take some time to absorb as it has so much in-depth and unusual information on the minerals. The Book of Stones is written by Robert Simmons and Naisha Ahsian. It is published by Heaven and Earth Publishing. There are now three different versions of this book, an older version published in 2005, a newer one published in 2007 and the latest published in 2015. The latest version has additional stones added, but these have comments only by Robert Simmons so it looks like there is no longer any participation by Naisha Ahsian. It is also available on kindle, so that can be helpful if you want to be able to take it with you when shopping, and you can get an Amazon kindle app for free to use on desktops, Iphones and Ipads if that is what you use. There is some controversy in crystal circles over the actions of one of the authors, in regard to his trade-marking a large number of crystals. I understand their feelings but in my opinion this does not detract from the value of the information contained in the book. I quite like the fact that you get two different approaches to how to use each crystal in the Book Of Stones, so this is helpful. The two authors do not always have the same approach and this in itself is good. 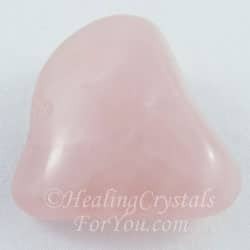 If the authors of crystal books are not always completely in agreement about how to use a crystal, it allows you to understand that each of you have the ability to decide what you feel about the attributes of a particular stone. Robert Simmons covers his trademarked stones in great detail, so if this is of interest to you you will find this book very helpful. The photos are good and after each crystal there is a summary, which is a good inclusion. He has also written a couple of other books, including his smaller pocket sized book which I have reviewed above, and an in-depth book about Moldavite. Crystal Co-Creators is written by Dorothy Roeder. Dorothy has a totally different approach to how she uses crystals, and this is not one of the crystal books that I use as much as the others. It is more a reference for when you need help that you are unable to find any other way. What she tells you about different crystals and stones, fills the gaps not covered by some other books. 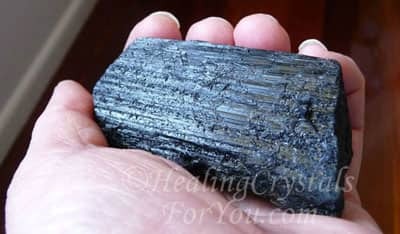 She has pages that list combinations that can be used for healing particular problems, and this approach is a good one if you use crystals specifically for healing. Her information is channeled and I have found that much of it is spot-on when I have utilized it. It is well indexed and she also provides other crystal knowledge both in the front of the book and after the information on the individual crystals. Her photos are unusual and quite interesting. A fascinating and somewhat different approach to using crystals. I have of course read many more crystal books than those above. With the large number available it is hard to choose the top books from all the many books about crystals, but this was my choice. The books about crystals that are reviewed were chosen based on my personal preferences, and how usable they were to be across the board, both as a new learner and as a healer. I have covered the attributes of a large number of crystals here on my site, but I love nothing more than sitting down and flicking through one of these books and discovering crystals that I haven't yet seen. Enjoy your reading! "I suggest that the only books that influence us are those for which we are ready, and which have gone a little further down our particular path than we have yet got ourselves." EM Forster.